Every student in the Department of Biochemistry was inspired to pursue science at some point in his or her life. Some students enjoy paying that inspiration forward. By getting involved in the Adult Role Models in Science (ARMS) program, they are engaging elementary and middle school students in science. The ARMS program is run by the Wisconsin Institute for Science Education and Community Engagement (WISCIENCE) at the University of Wisconsin–Madison but also functions as a community organization. University students feed into the ARMS program through a two-semester course they take on campus. In the course, they learn about how young students learn science and also exactly how to engage them in activities. They then go out to schools to put to use what they’ve learned. Students have taken part in the program in the past and several, including undergraduate biochemistry majors Ben Ehrlich and Jefferson Driscoll, recently finished their year of the course and mentoring. All reflect on their time as inspirational and empowering for both themselves and their students — carrying on the Wisconsin Idea to use their education to impact others. science engagement course he ran a science club for a students. The ARMS program is managed by Dolly Ledin, who also teaches the course on science engagement to undergraduates and graduate students. While she is retiring this summer after 27 years in the role, the programs will continue. The program current collaborates with more than 30 sites. 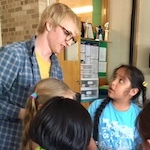 Many university students that enter the class are enthusiastic about sharing science with younger people but may not know exactly how to do it. Ledin says that in her course the students work in groups to practice actually doing the activities they will do with the kids, critiquing each other on their performance. For example, they make sure the presenter leaves enough time for kids to process what they learned or suggest that students perform a certain task at the white board themselves rather than the presenter doing it. The programs also have avenues where graduate students can get directly involved in classrooms and mentor middle school students. There are also family science nights that provide a shorter-term commitment. Ehrlich graduated in May with his biochemistry degree and says he wants to continue working to get youth engaged in science. Through the class they are armed with the tools and know-how to actually engage younger students. University students that participate in the program often go down many paths afterward: some become teachers or others pursue a degree in science or medicine but continue to actively volunteer or mentor young people.